This mod is outdated. Please use whiterider's mod instead. This mod disables the policeman that sends teenagers home at night. Where I live, it is not forbidden to walk around in the night, and I think, it makes no sense, that a policeman telepathically knows about someone wandering around in the night at the other end of the town. It will not stop children from running home, and it will not disable the moodlet. This overrides the Police XML resource with the ID 0333406C_00000000_895FB6C3111A65E0. It will conflict with other hacks, that override this resource, which would be mainly hacks, that change some police behaviour. But not every hack that changes police behaviour will conflict, of course. 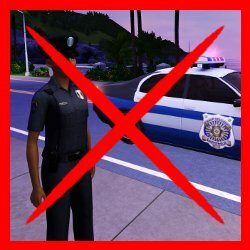 It is compatible with awesomemod, which allows to disable the curfew policeman, too. In the worst case, it is just disabled a second time at different positions. nocurfew_jonha.zip | Description: Disables the curfew policeman completely (will still come for burglars etc. of course). ! !Use only with version 1.0-1.4!! less_curfew_jonha.zip | Description: Reduces the chance for the policeman to come to about 27% per hour. ! !Use only with version 1.0-1.4! !